This factory once was a large paper mill, but now is only used by Nishino-san. He specializes in a paper called “kyoku-shi”, which is a type of paper that was formed in the early Meiji period, mainly for printing Japanese currencies for its durability and printability. Since then, kyoku-shi has been used for stock certificates, cards, and other prints. 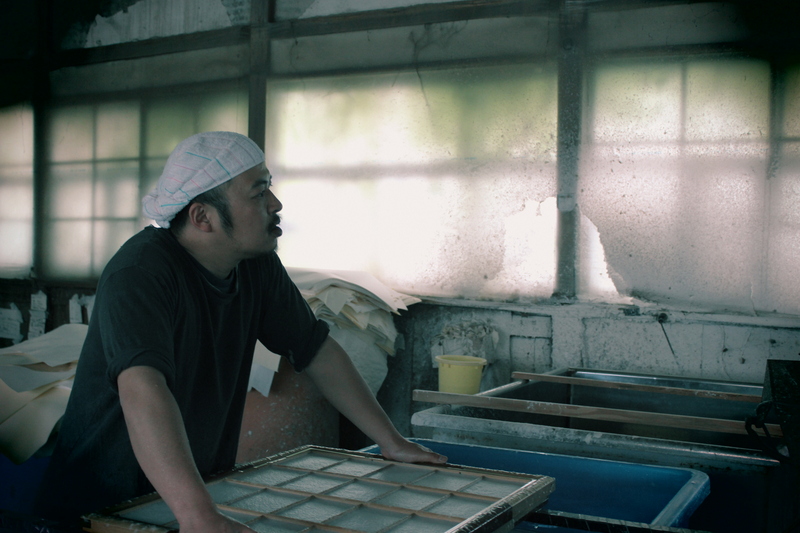 Nishino-san’s drying method is quite different from other Japanese papermakers, since he doesn’t smooth each individual paper onto a drying board. Instead, he uses drying boards that have a large square opening in the middle, and the actual post-card sized papers are sandwiched between 2 sheets of paper, then glued onto the board. Using the drying boards below, he carries piles of freshly pressed papers up a steep flight of stairs, and starts the drying process. Then, he would brush paste onto the edges of the backing paper, and glue the set onto the drying board, along the wooden frame. Since most of his papers only range from postcard sizes to A4 sizes, by using this method, he can save the time needed to peel each paper off and then brush them onto a drying board. 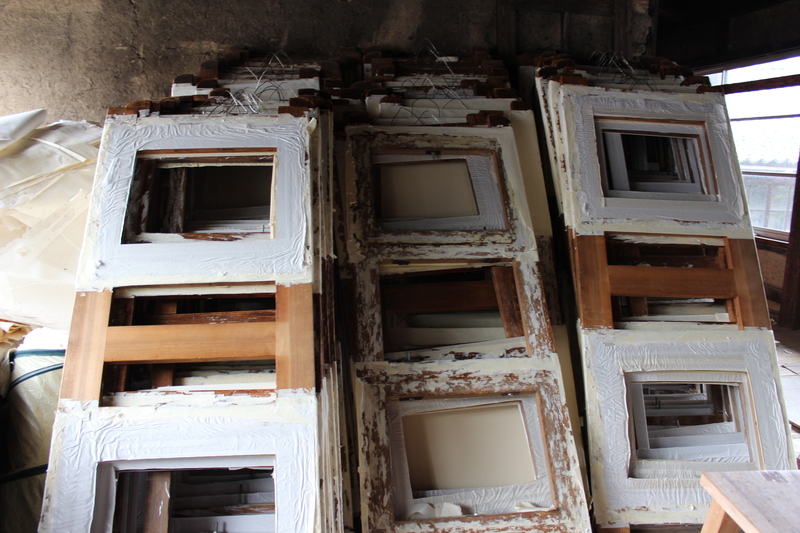 We were able to see Nishino-san’s papermaking demonstration, in the end. 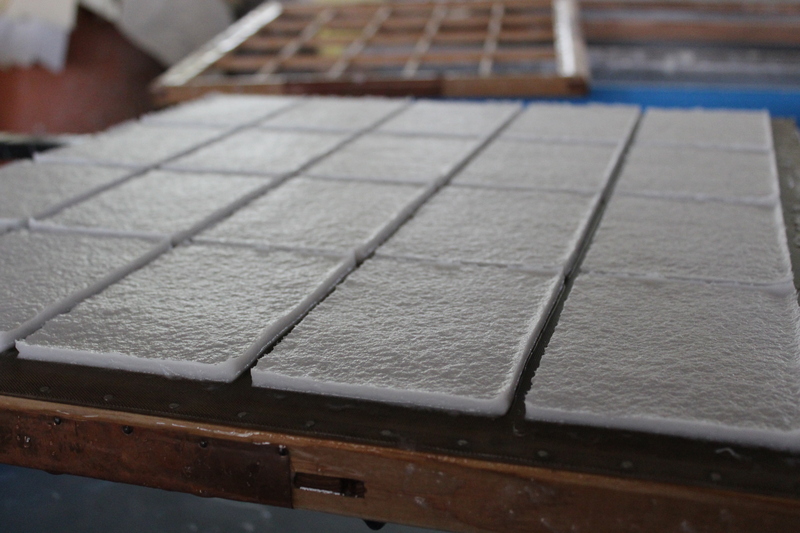 Since tamezuki does not use any neri to bind the fibers, the amount of water and fibers from the vat must be even to create even thicknesses of paper. This visit to Nishino-san’s was fitting for our last stop, to finish off our Fukui tour. This location was full of new information, surprises, and laughs. All of the papermills we visited were quite different in their methods and traditions, but their strong drive and will towards the future of Japanese papers are what they all have in common.